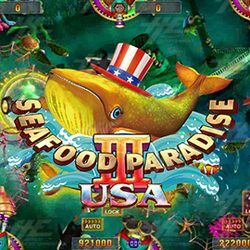 The USA Edition is a follow up in the series of Seafood Paradise video redemption games. The marine-themed game has 16 all new fish characters, seven powerful special weapons and new ocean scenery. The game is designed to look attractive on high-definition screens. Seafood Paradise 3: USA Edition game kit is playable on redemption cabinets that support 4, 6, 8 and 10 players at any one time. For more information about these games, check out their profile page on Arcade Game Sales, email us or call (02) 4968 9313.